Since its transformation from “Trinity College” to “Duke University” in 1924, the humanities have been both central to Duke and among its strongest departments , and since the 1980s, an increasing number of Duke’s humanities departments have been consistently ranked among the top 10 in the nation. The centrality of the humanities to Duke University was recently underscored by the selection of Duke University President Richard Brodhead as co-chair of the American Academy of Arts and Sciences committee charged with reporting on the state of the humanities and social sciences in the U.S. 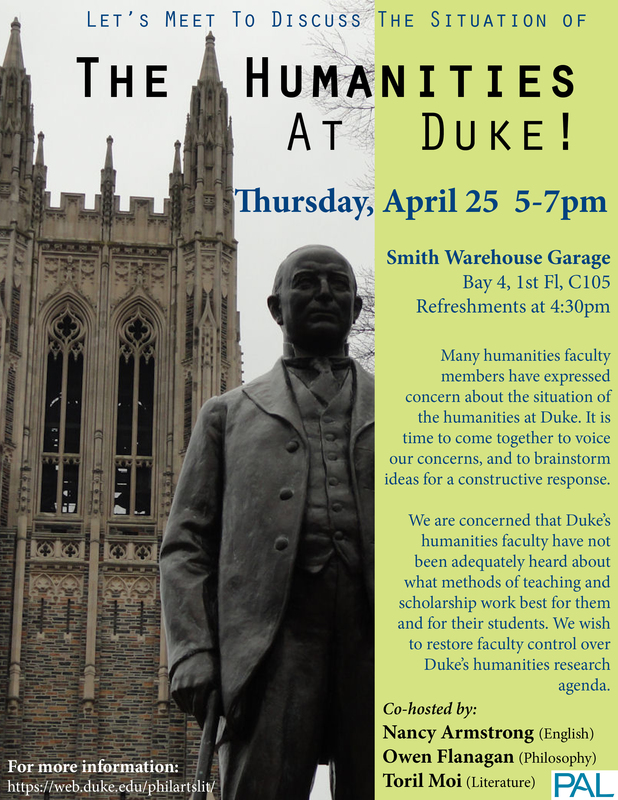 In order to ensure that the humanities continues to occupy its central role at Duke, a group of over 85 faculty members from the humanities and social sciences at Duke University met on April 25th, 2013 to discuss the current state of the humanities at Duke. One result of this meeting was the creation of The Humanities Faculty Collective (HFC). Through its website, committees, and listserv, the HFC seeks both to ensure that the humanities remain central to Duke, and—equally importantly—to ensure that the accomplishments of humanities scholars and departments at Duke are known to both the Duke community and to the wider world. The listserv venue is a forum for open conversation, debate, and suggestions. We hope that the listserv will continue to expand the ongoing conversation about policies concerning the humanities. We suggest usual listserv etiquette that takes into account the entire group who will receive your message, and we ask that messages be signed. We look forward to continuing the conversation with you. You may subscribe to the HFC listserv by using our contact form here to request to be added to the list. Any one who subscribes is welcome to post by sending an email to humanitiescollective@duke.edu . If anyone has further suggestions of events and announcements to be included on the website, including resources about the humanities, please email Heather Wallace, HFC web coordinator. See Robert Franklin Durden, The Launching of Duke University, 1924-1949 (Durham, N.C.: Duke University Press, 1993), esp. 1-26, 112-55.